On a chilly July evening in Melbourne, someone is murdered in the back of a cab. No one knows who he is or why he was murdered. The only suspect is the man who was in the cab with him for part of the journey home. But this man also has no name, no description, nothing to distinguish him from the throngs of well-to-do gents who are out every night in late nineteenth century Melbourne. So begins The Mystery of a Hansom Cab, best-selling work of Fergus Hume, and a positively ripping yarn it is too. This baffling case is handed to Detective Samuel Gorby. He and a host of characters traverse the length of Melbourne society as their investigations into who this man was and why he was murdered take them from the drawing rooms of cattle kings to slums presided over by foul-mouthed drudges killing themselves with drink. Even as suspects are thrown into prison to await the gallows, secrets from the past come back to reveal new twists that might save or condemn innocent men. Before there was Agatha Christie, before there was even Arthur Conan Doyle, there was Fergus Hume. 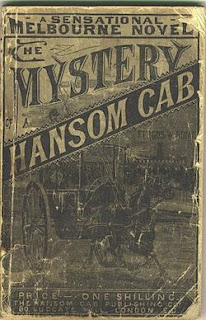 The Mystery of a Hansom Cab was Hume’s first novel. Rejected by publishers, he self-published in 1886 and the risk paid off. Within months of publishing, the book had been read by 20,000 people in Melbourne. Impressive at a time when they cities’ population was less than half a million and literacy levels were significantly lower than they are today. The rights were subsequently bought by an international publishing firm and The Mystery in a Hansom Cab went on to be an international best-seller. It was in fact the best-selling detective story of the 19thCentury, beating out Conan Doyle’s early Sherlock novels such as A Study in Scarlet (1887). The twisting, complex story line provided inspiration for Conan Doyle and his later works. Having recently read Agatha Christie, I can even see the similarities in the techniques of distraction and deflection as the author leads the reader on a merry dance through the list of suspects and surprising revelations. A hansom cab on the streets of Christchurch. 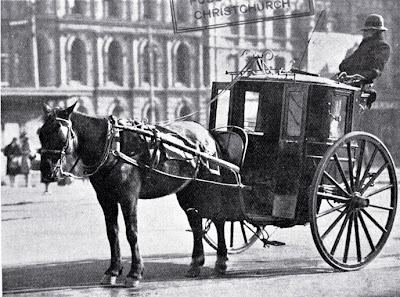 Thanks to the international success of The Mystery of a Hansom Cab, people all over the world heard about Melbourne, St Kilda and the slums of Little Bourke Street. Australia leapt into people's living rooms, and perhaps it was a depiction of a place and a people not so very different from any other metropolis as they might imagine. Still from the recent ABC adaptation of Hume's novel. The city of Melbourne is not just the back drop, but a character in the story. Places, distances and landmarks play integral roles in solving the case. The modern reader may recognise the landmarks and suburbs as they are mentioned by Hume, but the 'slums of Little Bourke Street' are a long way from the smart retail and cafe-splattered piece of bitumen it is now. The Mystery of a Hansom Cab is an honest and terrific read. It may not be as intricate as the modern thriller and perhaps the various 'accents' are a little hard to read, but I certainly didn't care. This is simply a great detective story. Before you are even a third of the way through you understand why it took the world by storm. Re-published by Text Classics publishing, you can pick up copy in any decent bookstore for around $13. The ABC also recently produced a television movie adaptation of the novel. You can read about it online or buy the DVD at ABC shops. Me, Guillaume and the Jellybean.